The clock is ticking down to the arrival of the Air Force's first two F-35s, which are on track to arrive at RAAF Base Williamtown on Monday. Here is a quick re-cap of Defence Connect's special series lead up to the arrival of the F-35. As part of Defence Connect's month-long special series in the lead up to the arrival of Australia's first two F-35s on Monday, we have worked closely with partners across industry, government and defence. Doing so has allowed us to provide a thorough and comprehensive analysis and insight into not only the F-35 itself, but also the individual companies that have contributed components, experience and expertise, and the companies that will provide training, maintenance and sustainment services throughout the operational life of both Australian and allied F-35s. This has also enabled Defence Connect to discuss at length the role the aircraft will play in transforming the Air Force as it moves towards fully implementing Plan Jericho and establishing Air Force's role within the future 'joint force' ADF. In case you missed the special series, this will serve as your catch up to prepare you for the arrival of Australia's first F-35s. Week one: In the first week, we focused on introducing the F-35 and the concept of not only a fifth-generation fighter aircraft, but also the fifth-generation weapons systems, the specialist engine and airframe maintenance, sustainment services and infrastructure, and the next-generation training and support services for pilots and aircrew that have slowly been building local capacity to keep Australian and allied aircraft mission ready. The introduction of one of the F-35's key future weapons systems; the Naval Strike Missile (NSM), which has been developed through extensive collaboration between BAE Systems Australia and Kongsberg Defence Australia and will serve as one of the platform's key long-range strike weapons, enhancing Australia's strategic deterrence capabilities. Sticking with the theme of complex, advanced weapons systems, Raytheon Australia outlined the various air-to-air and air-to-surface weapons systems that will ensure that Australia's F-35s are armed with leading-edge air dominance and precision strike capabilities, while remaining interoperable with Australian and allied F-35 and legacy airframe fleets. For TAE Aerospace in Queensland, the F135 engine modules and the complex turbine engine maintenance required to support each of the individual variants of the F-35 has served as a boon for developing a regional, Asia-Pacific hub for complex engine turbine maintenance, overhaul and upgrade (MRO&U) at a state-of-the-art facility in Bundamba. TAE's success in positioning itself as the Asia-Pacific engine and turbine maintenance and sustainment hub is opening avenues for further Australian industrial participation in the broader global F-35 supply chain. For Newcastle-based SME, Milskil, the roll-out of the F-35 platform has enabled the company to expand the training for both Australia's future top gun pilots and the air crews that are critical for keeping the aircraft combat ready and mission capable, through the introduction of next-generation training simulators and equipment. Week two: Kicking off the second week, we zeroed in on the industrial capabilities rapidly evolving throughout Australia, but more directly as part of the Williamtown Aerospace Centre (WAC) to provide complex support for the F-35 and its supporting systems, infrastructure and personnel. The second week also provided the opportunity to deep dive into the unprecedented capability delivered by the F-35A variant, following a world-first 'elephant walk', rapid deployability and expeditionary capability exercise by the US Air Force. BAE Systems Australia has been quietly establishing a regional airframe maintenance and sustainment hub at Williamtown in partnership with original Equipment manufacturer (OEM) Lockheed Martin and other industry partners, including Northrop Grumman, RUAG and General Electric. Advanced materials and manufacturing has served as a key component in providing the F-35 with its characteristic low observable or 'stealth' capabilities. Sydney-based Quickstep Holdings has been involved with the F-35 program from its earliest stages, which has enabled the company to establish itself as a world leader in the advanced manufacturing and aerospace manufacturing industry. The world's best fighter aircraft needs an equally impressive system to support initial crew maintenance training and aircraft familiarisation. KBR has been developing a virtual reality demonstrator to support Air Force support and maintenance crew in the early stages of support and maintenance training with a low cost training option. The US Air Force showcased the rapid 'surge' deployment capability of the F-35A at a major tactical and support exercise in Utah, which saw 35 aircraft launched in 11 minutes, supported by expeditionary style deployed ALIS and aircrews training under combat conditions. Hunter Valley-based manufacturing company, Varley marked a major milestone in Australia's industrial participation with the project following the delivery of the first of 15 deployable cabins to the Department of Defence. Week three: Over the third week of coverage, we focused on the integration of Australian industry within the global supply chain and the role F-35 has played in helping to enhance the competitiveness of local companies. Week three also saw a focus on the varying capabilities of the F-35 and its variants, particularly the F-35B and the capability it could provide the ADF following milestones with the Royal Navy, and the roll-out of training simulators and start of maintenance training for RAAF crews at Williamtown. 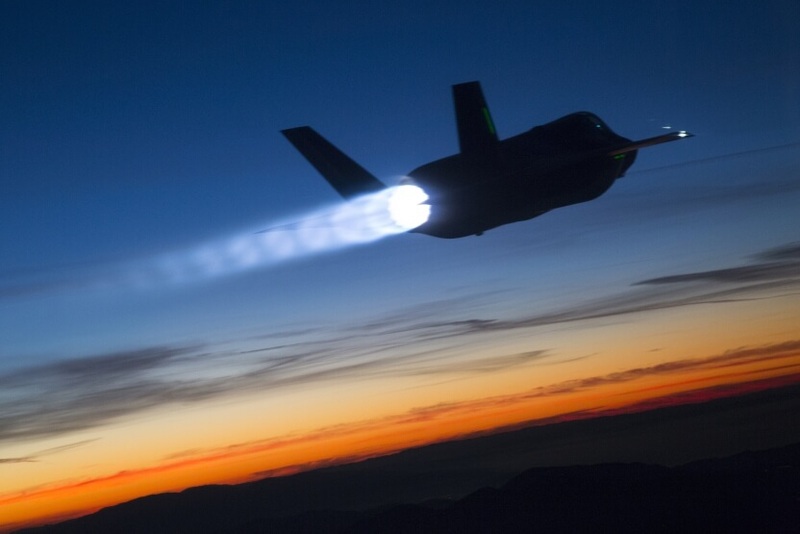 Newcastle-based Heat Treatment Australia (HTA) has leveraged the opportunity provided by the F-35 to springboard into global supply chains across the world, with a growing market share in the US supporting both military and civilian aerospace industries. The successful flight test for the Royal Navy's fleet of F-35B and the HMS Queen Elizabeth highlighted the versatility of the F-35 platform and the potent at-sea force projection capabilities when paired with the right naval platform, raising questions about the viability of a fleet of Australian F-35Bs operating from the RAN's Canberra Class LHDs in the future. RUAG Australia established itself as a global sole source provider for key components across the fleet of F-35 variants, showcasing the capability and competitiveness of Australian industry and its ability to value add in a highly competitive global supply chain. F-35 OEM Lockheed Martin has lowered costs for the Full Mission Simulator (FMS) unit, enabling F-35 pilots to get combat and mission ready quicker and cheaper. RAAF maintainers kicked off their support training at the Williamtown Integrated Training Centre (ITC) across the Ejection Systems Maintenance Trainer and the Weapons Load Trainer platforms following successful training rotations with US and global counterparts in Arizona. Week four: It's the final countdown! Week four kicked off with a focus on the various strike capabilities of the F-35, and we discussed the way in which the F-35 will change the Air Force and transform its operational capabilities for the next 30 years. Building on the conversation with the Air Force, we shifted focus to the JSF and its network-centric warfare capabilities, finally focusing on the growing buzz building at Williamtown with little under five days to go. As the Joint Strike Fighters near, we took the time to closely analyse the strike capabilities of the F-35A and introduced 'stealth' and 'beast' modes, which will enable the Air Force to tailor the weapons system package of the platform to the individual requirements of the mission. Commander Air Combat Group, Air Commodore Mike Kitcher, described the F-35 as providing a "quantum leap" in capability for the Air Force requiring both the RAAF and the broader ADF to rewrite the operational, tactical and strategic doctrines that have held true for the better part of the last 75 years. Fifth-gen aircraft incorporate a range of transformation technologies that enable the F-35 acting as a network-centric node providing intelligence, surveillance, reconnaissance and strike options within the broader network of an integrated Air Force and 'joint force' ADF. The air is electric at RAAF Base Williamtown as the base prepares for the arrival of the aircraft on Monday, with Group Captain Peter Cluff, Base Commander at Williamtown, providing an update on the infrastructure upgrades as part of the F-35A Operational Precinct ahead of the arrival of the "great new capability". Nationally, 15 companies at 18 different locations have been contributing to the F-35 program, supporting over 2,000 Australian jobs. The two aircraft are scheduled to arrive at Williamtown after 10:10am AEDT on Monday, 10 December, with members of the public along the Hunter coast to be treated to a formation flypast before they arrive at the base. From 9:50am, the public at Port Stephens will be able to see two F-35A Joint Strike Fighters and up to three F/A-18A/B Classic Hornet aircraft flypast, partly to ease congestion around RAAF Base Williamtown on launch day. Residents are advised to head to any vantage point or exposed location along the route to view the formation of up to five aircraft at least 30 minutes before the scheduled times. The scheduled route can be found here.